The Renal Sodium Bicarbonate Cotransporter NBCe2: Is It a Major Contributor to Sodium and pH Homeostasis? The sodium bicarbonate cotransporter (NBCe2, aka NBC4) was originally isolated from the human testis and heart (Pushkin et al. IUBMB Life 50:13–19, 2000). Subsequently, NBCe2 was found in diverse locations where it plays a role in regulating sodium and bicarbonate transport, influencing intracellular, extracellular, interstitial, and ultimately plasma pH (Boron et al. J Exp Biol. 212:1697–1706, 2009; Parker and Boron, Physiol Rev. 93:803–959, 2013; Romero et al. Mol Asp Med. 34:159–182, 2013). NBCe2 is located in human and rodent renal-collecting duct and proximal tubule. While much is known about the two electrogenic sodium bicarbonate cotransporters, NBCe1 and NBCe2, in the regulation of sodium homeostasis and pH balance in the rodent kidney, little is known about their roles in human renal physiology. NBCe2 is located in the proximal tubule Golgi apparatus under basal conditions and then disperses throughout the cell, but particularly into the apical membrane microvilli, during various maneuvers that increase intracellular sodium. This review will summarize our current understanding of the distribution and function of NBCe2 in the human kidney and how genetic variants of its gene, SLC4A5, contribute to salt sensitivity of blood pressure. Drs. Felder, Jose, Xu, and Gildea declare no conflicts of interest relevant to this manuscript. Gildea JJ, Xu P, Carlson J, Gaglione R, Wang DB, Kemp B, Reyes C, McGrath H, Carey R, Jose PA, Felder RA. 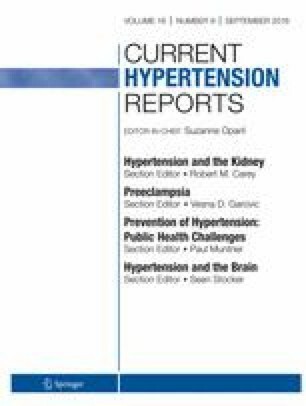 Role of human renal proximal tubule sodium bicarbonate cotransporter nbce2 (slc4a5) in salt sensitivity of blood pressure. American Heart Council for High Blood Pressure Research, 2015. Poster Abstract 242 http://my.americanheart.org/idc/groups/ahamahpublic/@wcm/@sop/@scon/documents/downloadable/ucm_477293.pdf:PA242. This abstract is the first demonstration of a link between polymorphisms in SLC4A5 and aberrant renal sodium regulation.